Checkout this game on the Play Store! 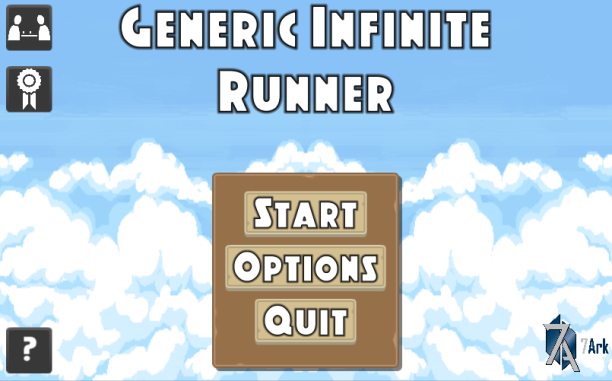 Generic Infinite Runner is a simple 2D side-scrolling infinite runner where you are trying to run the farthest distance possible! Avoid 3 different types of enemies, and collect gems to buy upgrades for your character. This is what I consider my first full solo game! I finished and published it to the Play Store. I considered the App Store, but it’s far too expensive for my free game. I remember I had some initial trouble with my terrain generation. I had the player not move horizontally, and the terrain moved to the left. But because the terrain was actually moving, it caused the terrain to separate often, so I had to actually change the system. Ultimately I rewrote the whole thing to have the player move to the right, and the terrain generate once they’ve reached a certain point. I also had a bit of issues messing with the vert’s, in Unity with a sprite you don’t have access to the vertices. So instead they’re all quads facing the camera, and the left two corners are set to the position of the last terrain piece’s right two corners, and the right two corners are set to random points (within parameters). Once that was set up, it was pretty easy going for a little while, generally coming up with ideas and implementing them. I can’t think of any particular snags I hit. The larger snag I had was with play testing, since I was so used to my game it is hard to know what is easy or hard for players. And generally the game was too hard for most players. I had to slow down enemies, and implement a tutorial mode. There were other things too, like players not understanding how to use the Boots upgrade properly. The last thing I really worked on extensively was integrating the Google Play services plugin for Unity, and that gave me a lot of trouble. I had never dealt with SHA1 fingerprints, or any of work that it took to integrate it. But after a lot of hassle I was able to get it done. I plan to continue updating G.I.R. as needed.